Within ten years, people aged 65 + are predicted to make up nearly 25% of the Kootenay Boundary area’s population. With the aging population, the use of health care resources is rising, which puts pressure on all health care sectors and the interaction between them. Family physicians, community, and acute services will need to respond to a growing group of patients with complex care needs. Upstream promotion and prevention with a responsive multidisciplinary team in community. Improving communications to care teams from emergency departments. Improve discharge processes to ensure success on return to community. Through the involvement of IH Acute and Community staff at this project’s advisory committee and working groups, we are integrating our project with pilot projects and initiatives already underway (48/6, Home First, and the ALC initiative). Awareness of other project work has enabled our team to narrow our focus to improvement goals not currently being addressed in Kootenay Boundary, share our learnings with other groups, and leverage best practices. 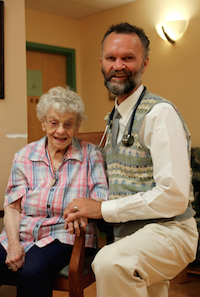 Our work in 2015-16 has hinged on further developing relationships with our IH colleagues involved in Frail Seniors. A report was written through early 2016 and later this year, lead administrators from the portfolios will be making recommendations to the Collaborative Services Committee (IH and Division) regarding next steps. Several professional team meetings have taken place between staff in acute/allied health and community portfolios with the objective of improving systems and processes relating to the discharge planning process for family physicians. Since providing a new Home Health Services algorithm for physicians and clinicians in April, the Frail Seniors Working Group has been working collaboratively with Interior Health to work on improving communications between community teams, including physicians. Integrated case conferencing meetings are being implemented in both Trail and Castlegar based on a model from the Nelson team. These regular bi-weekly meetings convened by Home Health review up to 10 patients in one hour depending on case load. Physicians are invited to participate in these patient discussions by teleconference which are typically 5 – 15 minute blocks as necessary for patient care planning. By involving key stakeholders in one meeting we reduce duplications of communications between care providers, and ensure efficiencies for use of time. The key aim is to be proactive in discussing patients with complex care needs (not intended for short term service patients ie: wound care, etc.) and prevent crises. Click here to view the June report card from the Frail Seniors with some of the most recent highlights and impacts of the project. IH and KB Division worked together to produce the "Home Health Referral Process" algorithm with the objective of streamlining HH referrals. Download it here. Working from a Home Health Service - led model of case conferencing, the Home Health team in Castlegar held its first meeting to discuss cases. The first test run limited the number of patients on their list for discussion, offering the opportunity to fine tune how the team runs their meetings, and which patients are prioritized for upcoming meetings. The Frail Seniors working group approved a 30-day readmission survey to collect qualitative data on patients’ experiences. The survey, based on a model from the Institute of Health Care Innovation, will be used to talk with patients about why they feel they had been readmitted to hospital, or had to return to the emergency department for help once they had been discharged home. The survey should be completed by April 2014.